Welcome to the 7th Annual Cast One for Hope! 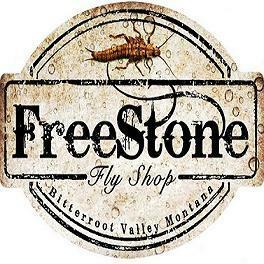 The Bitterroot Valley in Western Montana is set to provide you with the ultimate fishing experience with elite professional guides and fun events, plus the opportunity to support Casting for Recovery. We look forward to having you with us! Angler positions for the Cast One are sold out. To be placed on the Angler Wait List, please contact Peg Miskin, castone@castingforrecovery.org. You will be contacted if a position opens. Tickets to the Friday and Saturday events and the Paradise Valley Raffle Trip are still available. Help us kick-off an amazing weekend at Flying Horse MT in Corvallis, MT. This casual reception is open to anglers, guests, and local community members! The evening will include delicious edibles, local spirits, and music. Kick-Off Party tickets are $40. The full-day guided drift begins at 8:30am and includes a catered lunch. This is your opportunity to fish pristine Montana water with elite, professional guides. 2 anglers per boat, limited to 34 anglers. The Celebration Dinner and Auction will begin at 6:30pm with a gourmet dinner and wine pairings at Flying Horse MT. This memorable evening will include live and silent auction, awards presentation and live music. Fly fishing entry is $1,100 per angler and includes both Friday and Saturday evening events. Dinner-only tickets, $100. Local community members and CfR supporters are encouraged to attend. 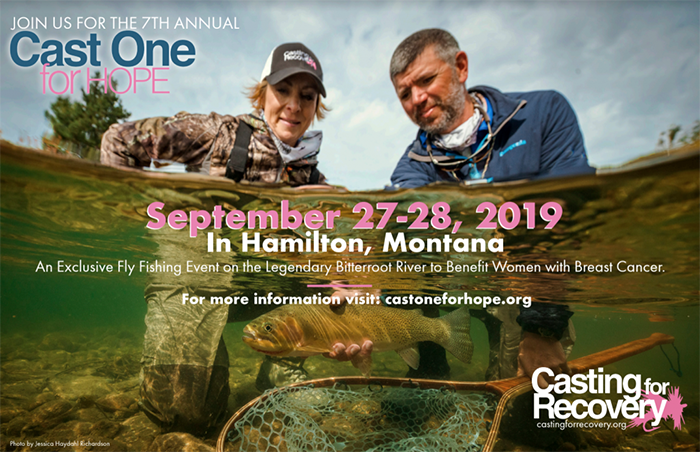 Discounted event tickets and fishing entry are available for CfR volunteers, alumnae and members of Sisters on the fly. Fishing Cancellation Policy: A full refund of the Angling Fee will be given for cancellations on or before July 1, 2019. For cancellations between July 1 and September 1, 2019, 50% of the Angling Fee will be refunded. Cancellations after September 1, 2019 are non-refundable. Angling Fee may not be rolled over to future Cast One for Hope events. Please contact Peg Miskin at castone@castingforrecovery.org immediately regarding any cancellation. Each year we present a raffle trip as part of the Cast One for Hope event. 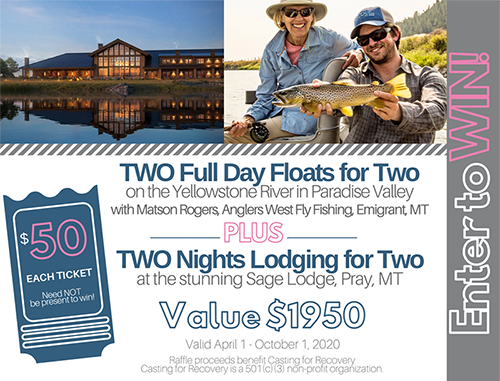 This year purchase tickets for the opportunity to float for two days guided fishing on the Yellowstone River with Matson Rogers of Anglers West Emigrant, MT and stay two nights at the beautiful new Sage Lodge in Pray, MT. Welcome to the Paradise Valley! These Montana outfitters and guides are providing the day’s drift, the cost of which is included in registration. Gratuity is not included and we encourage providing your hard-working guide with something extra in thanks for a great day on the Bitterroot! Please note that per Montana regulations, we are unable to award prizes for anything having to do with size, species or number of fish caught. No worries–we’ve come up with many other ways to recognize your fishing skills and the adventures of your fishing day! See awards below. Official rules are located HERE for the Single-Fly event. Saturday fishing locations: Casting for Recovery and your local fishing guide will communicate directly with you regarding fishing location, meeting place, and put-in. Accommodations: Please plan ahead and arrange your own accommodations, the cost of which is not included in your registration. Casting for Recovery has reserved a room block at the Bitterroot River Inn at a discounted rate.Please contact Peg Miskin castone@castingforrecovery.org if you need to book a room at the Bitterroot Inn. Click HERE for a full list of local accommodations. Mention your attendance to Cast One for Hope for any discounts available. Please feel free to contact us for assistance in arranging accommodations. We hope our Cast One guests will take advantage of the beauty of the Bitterroot Valley and its charming towns. Click HERE for a list of local area attractions, restaurants and contact information. We welcome the support of sponsors, who are an important part of the success of the Cast One for Hope. Please contact Peg Miskin CastOne@castingforrecovery.org or 707-529-2760 if you are interested in being an event sponsor. Check out our 2019 sponsorship opportunities HERE.